You may not know it, but you've got an untapped resource for crafting and organizing hidden in your cupboards right now-glass jars! Glass mason jars can be a wonderful way to store dry goods, and with just a little creativity, they can become everything from clever gifts to table decorations. You can find glass jars at most grocery or household item stores with canning supplies, but you can always use jars that you have and recycle while you craft. For a cute, country soap dispenser, use the pump from a soap dispenser you already have or purchase hand soap with a pump. Hammer a nail through the center of the jar's metal lid. Using the nail, push the sides of the hole until it is about an inch wide. Unscrew the pump from the existing dispenser, and see if it will fit in the hole in the jar lid. If not, widen the hole until the dispenser fits snugly. Seal the edge of the dispenser to the inside of the lid with glue. Then assemble the jar and make sure the dispenser straw fits inside the jar. If it is too long, cut at an angle with sharp scissors. Screw the lid on the jar, and you're done! For a cute, portable sewing kit, make a pincushion on the lid of a glass jar and fill the jar with sewing notions. Unscrew the lid from the jar, and trace the insert (on the inside of the lid) on cardboard. Cut this out. Trace and cut the insert on the fabric and cut out. Trace a circle at least 1-inch wider than the insert on a second piece of fabric and cut out. Glue batting to the cardboard piece. Cover batting and cardboard with the larger fabric circle. Push the batting, fabric and cardboard through the ring part of the lid, batting side out. Push down excess fabric onto cardboard and cover with the smaller circle of fabric. Glue down. Fill the jar with sewing notions like safety pins, thread and small scissors. Screw on the lid, and put pins in the cushion on the top of the jar. Terrariums can be a great way to keep plants indoors and show off small decorative items. Always start with a clean, dry jar. Add an inch thick layer of pebbles or gravel to the bottom of the jar for drainage. Add a layer of activated charcoal, about half an inch, to filter water and keep things clean in your terrarium. Add large layer of soil of at least 3-inches. Pull off a section of moss as wide as the jar and place root side down. Place small plants in the soil and push moss around them. Use the skewers or chopsticks to manipulate moss and plants in the jar if your hand won't fit. Once you have all your plants and moss placed, water until you see moisture on the pebbles at the bottom of the jar. Add decorations like small toys, figurines or pretty rocks for visual interest. Place terrarium in a sunny spot. Water no more than once every two weeks by misting or spraying. Keep the lid on the terrarium to keep moisture in. If the glass becomes too foggy to see the scene inside, take off the lid and let it dry for a couple of hours. There are many more crafts you can make with glass jars. As candle holders or vases, glass jars are popular table decorations for weddings and other gatherings. You can also fill jars with a mix of dry ingredients and give them as gifts. While some glass jar crafts require lids, you can use jars without lids for candle holders. Mason Jar Crafts at The Inspired Room showcases how to make Mason jar candle holders for any occasion. 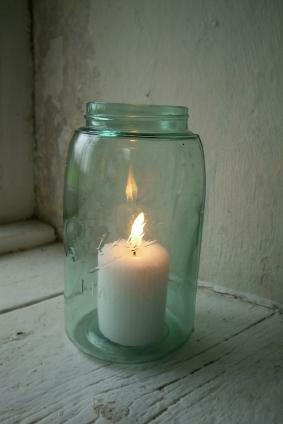 Antique canning jars can be perfect for candle holders. Gingerbread Snowflakes has a great tutorial for colored jar candle holders for springtime. Painted jars make great display items. At Crafts By Amanda, learn how to paint glass jars for kitchen decorations for the Fall or any season! You can give glass jar crafts as gifts. Recipe Goldmine has a lot of dry mixes for making Mason jar gifts like cookies and drink mixes. Glass canning jar manufacturer Ball has a wealth of craft ideas for their jars. You don't have to use new Mason jars for these crafts. Experiment with used jars you have lying around. To prepare jars, first soak jars with paper labels in warm, soapy water to dissolve the paper. To remove glue residue, wipe with a paper towel dipped in baby or cooking oil, and then clean off excess oil with glass cleaner. For food crafts or storage, always run the jar through the dishwasher to clean and sterilize. If you are recycling glass jars and want to hide the logo on the lid, paint the lid with spray paint. You can also cover lids with decorative paper and seal with a clear sealant. No matter what kind of jar you use, you will have hours of crafting ahead of you!